Now nearing 50, Darius McCollum has been arrested more than 20 times for illegally operating New York transit trains and buses, impersonating transit employees, and other transit-related crimes. Headlines say his crimes amount to joyriding, but Darius isn’t out buzzing the traffic. Instead, he drives routes professionally, announcing all stops, getting “his” passengers from A to B, and generally trying to be a helpful presence. 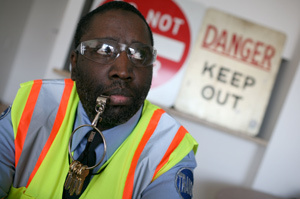 Darius McCollum is a New York City subway savant. Diagnosed with Asperger’s syndrome, Darius says he feels comfortable with the transit system in a way he doesn’t with other people. When he was 12, he was sort of a mascot to the subway workers who would let him make an announcement or close the doors. He knew everything about the system, the routes, the hardware, the etiquette — everything. His mother remembers people would call him to ask for advice on how best to get to different parts of the city. Unfortunately, when he was 15 and still too young to apply for a job, a train driver invited Darius to drive down to the end of the line and back while he — the real driver — went off to meet with a girlfriend. Darius couldn’t refuse. It sounds like he did a fine job, too, making all the stops on time. But when he got to the end of the line, and before he could turn around and return the train to his enabler, someone caught sight of him and reported him to the police. He was arrested, and ever since then he’s been considered persona non grata by the MTS. Which is too bad for all involved, because instead of being the MTS’s most dedicated, most passionate, most knowledgeable employee, Darius has spent half his life in jail, and the other half trying to get close to the NYC subway system. Darius is charming and open on camera. He freely admits to his crimes, explaining that he just really wants to drive for the transit system. After just a few minutes you’ll be rooting for Darius, and by the end of the film, you’ll be calculating how to get this gentle man what he wants while allowing his “victims” — transit bureaucracies who can’t afford any bad publicity — to have what they need. Off the Rails includes lots of interviews with people he’s crossed paths with — his mother, social workers, lawyers, Asperger’s advocates, and others. The impression they convey is that Darius has done no real harm — though I’m sure transit’s lawyers would disagree. I feel confident in saying that no harm was intended. His fascination never led him to do anything recklessly (at least as mentioned in this documentary). But the court system sees him as a menace to society. If only someone could hire him and make use of his passion... but fate seems to have a different story in mind for Darius. You can find some larger themes in Darius’ story. In particular, it’s obvious that the criminal justice system in New York is a pretty terrible way to solve a problem like Darius. He’s spent years in jail just waiting for trials, which by itself should be shocking and shameful. But the real tragedy seems to be that the talent and passion of a potentially productive member of society are going to waste. Don’t get me wrong. Off the Rails doesn’t try to preach, nor does it offer any specific suggestions on what would be best for Darius. With such a charismatic protagonist and such an interesting conundrum at its core, Off the Rails doesn’t need to add anything extra.